and I enjoyed eating it with hot rice and Mor Kolumbu my Hubby's favourite. 1.Put a wok on flame,when hot add cumin seeds and when the splatter add the cut capsicum and mix well so that oil is coated well.Cover it with a lid and cook it for approximately 10-15 mins.Stir in a while. 2.By now the capscium must have turned 70% done and not lost their crunchiness. 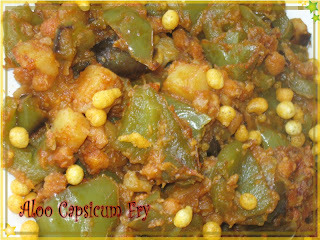 3.Now put in the diced and boiled potato,chopped tomato ,add salt,garam masala mix well and cook it covered for another 4-5 mins,remove the lid and now let the aloo n capsicum fry for another 5-8 mins,add the Boondi to it mix well,when done turn off the flame and serve it with hot rice or Chapathi. Before serving add some more Boondi on top this gives the crunchy effect and tastes different. 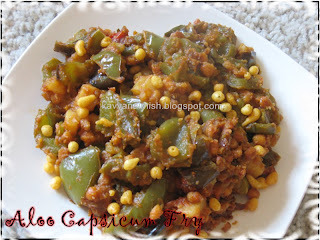 Sharing this recipe for AFAM-Bell Pepers event by Priya and Maheswari. My fav combination..looks tasty and delicious..feel like having some right now.